The dead wife of an author returns during a seance to get revenge on her husband. What a disaster of a show! We were a group of four relatively young people (mid-to-late 20's) that purchased half price tickets to Blithe Spirit. None of us enjoyed the show - it was probably one of the most boring Broadway shows I've seen. The humor is very dry British humor that's probably targeted at an older generation. I can see this play being something my grandma would enjoy. I've probably seen 20+ broadway shows, and I have never been so bored. 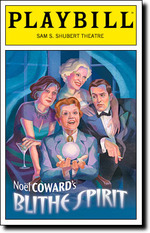 Blithe Spirit takes place in a room in a large house. The set is pretty impressive (it's well decorated), but there's nothing interesting about the story. A man participates in a séance, and to his surprise, his ex-wife appears and won't leave him alone. He is the only one who can see or hear the wife, so there are some mildly humorous scenes that made me chuckle. The show then revolves around trying to get the ex-wife to go back to the "other world". It's probably worth mentioning that the audience was mostly full of older people, and many of them seemed to really enjoy the show. In my opinion, it was certainly not worth the $60 we paid for half price tickets. The humor in this show was probably targeted at a much older generation. I did not find this play very funny or entertaining. The storyline was poor and the jokes were very PC and dull. The set was nice... The actors cold have done better... anyone could have done better! The show was witty, and the sets were impressive, but I didn't think the show had much substance. Angela Lansbury makes the play.